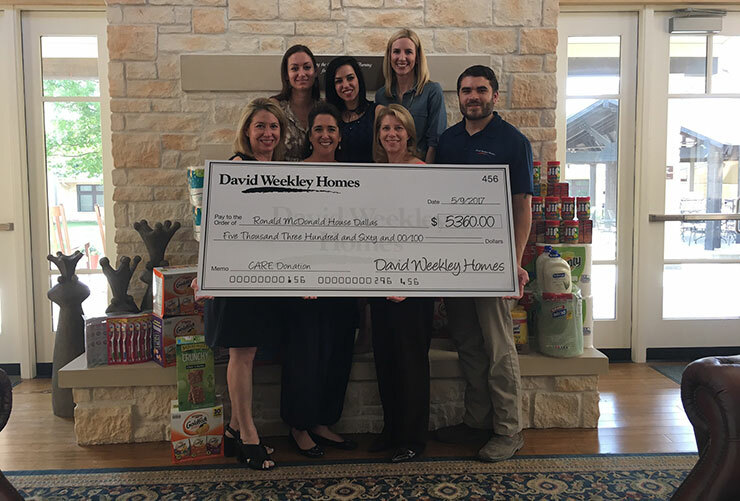 David Weekley Homes team members in Dallas present a donation and provided supplies to Ronald McDonald House Charities of Dallas as part of the company’s CARE initiative. Dallas, TX (May 16, 2017): The nation’s largest privately-held home builder celebrated more than 40 years of Building Dreams, Enhancing Lives by hosting David Weekley Homes World’s Largest Showcase of Homes. From April 1-30, more than 9,100 visitors stopped by model or showcase homes across the country to see current innovations in design and décor trends. As part of the company’s charitable and philanthropic efforts, a $5 donation was given to a local nonprofit organization for each visitor who registered with a sales consultant during David Weekley Homes World’s Largest Showcase of Homes, amounting to more than $45,000 for 18 local charities. In Dallas, more than $5,300 was donated to Ronald McDonald House Charities® of Dallas, which will provide 357 night stays for families. “We are thrilled that this year’s Showcase of Homes benefitted Ronald McDonald House of Dallas and look forward to working with them again in the future,” said Neville Crowell, lead sales consultant with David Weekley Homes in Dallas. For more information about David Weekley Homes in Dallas, visit www.davidweekleyhomes.com.